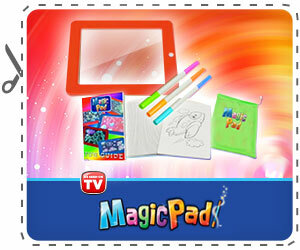 As Seen On TV MagicPad - The New Way To Draw, Sketch, & Create So All Your Art Illuminates! MagicPad is the fun, new way to draw, sketch and create. Simply press the button to make all your art illuminate! No more boring pencils or messy paint. The unique clear screen wipes easily clean! MagicPad is portable and has 8 different light effects. Make learning fun and create art that glows with MagicPad.